One can take from this the lesson that the genome is very plastic. One thinks of the strenuous efforts of Darwinian biologists to demonstrate speciation according to their concepts (Darwin’s finches come to mind). And it’s probably all for nothing (except ensuring that school textbooks continue to misrepresent the history of life). This is not just an anomaly with Dolphin DNA. Kangaroo and Human Genomes are also unexpectedly similar genetically. The researchers were surprised to find that placental and marsupial mammals have largely the same set of genes for making proteins. Instead, much of the difference lies in the controls that turn genes on and off. Excerpt: “We were very surprised to find, that for many categories of proteins, sharks share more similarities with humans than zebrafish,” Stanhope said. “Although sharks and bony fishes are not closely related, they are nonetheless both fish … while mammals have very different anatomies and physiologies. Excerpt: What’s the difference between a frog, a chicken, a mouse and a human? Not as much as you’d think, according to an analysis of the first sequenced amphibian genome. The genome of the western clawed frog, Xenopus tropicalis, has now been analysed by an international consortium of scientists from 24 institutions, and joins a list of sequenced model organisms including the mouse, zebrafish, nematode and fruit fly. What’s most surprising, researchers say, is how closely the amphibian’s genome resembles that of the mouse and the human, with large swathes of frog DNA on several chromosomes having genes arranged in the same order as in these mammals. The results of the analysis are published in Science this week1. Moreover, Darwinists simply have no evidence that mutations to DNA can produce morphological novelty, as Jonathan Wells states in the following article, Studies using saturation mutagenesis in the embryos of fruit flies, roundworms, zebrafish and mice also provide evidence against the idea that DNA specifies the basic form of an organism. Biologists can mutate (and indeed have mutated) a fruit fly embryo in every possible way, and they have invariably observed only three possible outcomes: a normal fruit fly, a defective fruit fly, or a dead fruit fly. Moreover, the failure of the reductive materialism of Neo-Darwinian evolution to be able to explain the basic form of any particular organism occurs at a very low level. Much lower than DNA itself. Moreover, to state what should be glaringly obvious by now, since neo-Darwinian explanations are grossly inadequate for explaining how any particular organism might achieve its basic form, then neo-Darwinian speculations for how one type of organism might transform into another type of organism are based on pure fantasy and have no discernible experimental basis in reality. ,,,is found to be very well supported in its claim that God has formed each of us, i.e. each of our eternal ‘souls’, in our mother’s womb. 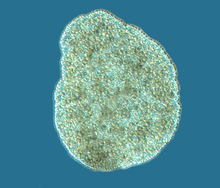 The world’s simplest animal is trichoplax adhaerens. It is so simple that researchers wisely decided to forego the venerable Biological Species Concept that depends on an animal’s form (tricoplax doesn’t have much of a form) and just use genetics. Just a correction. The species concept itself does not “depend” on form. Using form alone you couldn’t distinguish between a male and female angler fish. For many bacteria, you cannot distinguish different species using form alone. Sometimes chemical interactions are needed. Form (shape, size, dimensions, etc.) are often used as a convenient tool to shoehorn an unidentified (by the individual examining it) organism into a classification. They use published identification keys. But these keys are only tools. If there is a discrepancy between the key and the genetics, the genetics rules. The species concept itself does not “depend” on form. Using form alone you couldn’t distinguish between a male and female angler fish. …yet somehow he still manages to draw the wrong conclusions.